Representative Honours: Northern Ireland: 14 Full Caps/2 Goals (1974-1980), 5 Amateur Caps / 1 Goal (1972-1973). Club Honours: (with Crusaders) Irish League Champion 1972/73; (with Cambridge) Football League Division Two Runner-Up 1977/78; Football League Division Three Champion 1976/77. Tommy Finney can consider himself unlucky to never have played English top-flight football. He twice played in Second Division sides that won promotion, yet each time he was sold before gracing the First Division stage. First time around it was with Luton, who finished as runners-up in 1974, but were forced, due to financial difficulties, to sell a number of their stars, including Tommy, so he joined Sunderland that July for £70,000. Just two years later the Roker Park club finished as Second Division Champions, but Tommy had failed to settle and he moved to Fourth Division Cambridge in August 1976 in a knock-down £10,000 deal. With Cambridge he was back in the Second Division by 1978, but again could get no higher. An entertainer, Finney was recalled in Nick Hornby’s book ‘Fever Pitch’ for his antics, often ‘hoodwinking’ opponents with tricks and dives, following these up with outrageous winks to the crowd. He was no wilting flower when it came to the rougher side of the game either, he never balked from a 50-50 challenge and happily got stuck in when elbows were flying. His form at Cambridge saw him linked with a number of big clubs, but a move never materialized, and bar a brief spell with Brentford between February and December 1984, he spent the remainder of his career with Cambridge in the lower Leagues. Linfield-crazy as a kid, Finney played for their junior sides before having a trial with Manchester United. Homesickness saw him return home to play for Distillery then Crusaders where he made his name. He scored seventeen goals as the Irish League title was claimed by Crusaders for the first time in 1973. Luton Town were the first of several interested English clubs to whip out the cheque book in August 1973, splashing £17,000 on the twenty year-old. Finney scored on his international debut, in a 2-1 defeat by Norway in September 1974, and again against Wales the following May. That goal against Wales came from a goal-mouth melee - some rate it as the worst ever scored by Northern Ireland - with Tommy sliding in to poke it home. 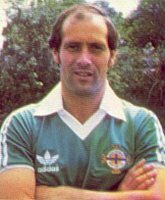 In those days Finney played up-front for Northern Ireland, but after dropping down to the Fourth Division he lost his place in the Northern Ireland squad, and wasn’t capped at all between May 1976 and October 1979. His return was capped with a place in midfield as he played in every game for Northern Ireland’s 1980 British Championships winning team. His last cap was won, playing in his preferred striker’s role, during Northern Ireland’s tour of Australia that summer and his last involvement with the squad was at the Spain '82 World Cup finals. Summary: 13(1)/2. Won 5, Drew 4, Lost 5. According to the eu-football.info site, Tommy gained 15 caps, not 14. Comparing the lists, the extra match is 3-3-76 v Israel. Did he play?